This is the second in a series of blogs about favorite running spots. The spots where no matter how slow of a pace we did or how bad it felt...it is always a good run because we're in our favorite spot. If you have a favorite spot that you would like to share please e-mail me by clicking HERE. 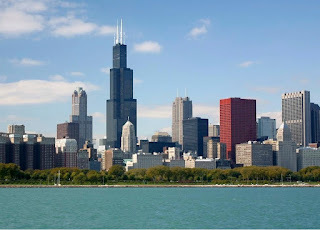 Thank you Rebecca for doing a phenomenal guest blog on my favorite city! As a runner, I consider myself lucky to live in Chicago. The city is really well designed for runners, even if that wasn’t the intent at the time. The city has wide sidewalks that are relatively clear of obstructions. Garbage is hidden away in alleys, so the only items that might be in your way are patio seating for a restaurant or planters. Because of the fabulous public transportation, there are always people out walking, so you can run and people watch at the same time. You can also stop and pet the dogs, which seem to be everywhere on their walks. Most owners are responsible, so you won’t have to worry about dodging dog poo. There are cars out, but many corners have no turn on red signs or are four-way stops, so it’s relatively safe for a runner. Bicyclists are supposed to be in the road, so they are rarely an issue on the sidewalks. If you want to avoid traffic, businesses and commuters, you can always get off the sidewalks and head to the parks. 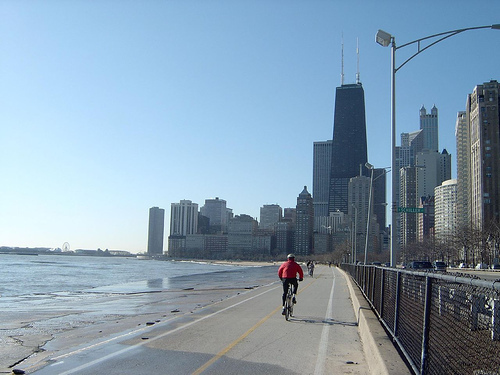 Chicago has hundreds of parks all over the city and many of them have paths for running. Some even have tracks for speed work. Many of the parks also have gyms and health clubs that are much lower cost than a private gym. So, if the Chicago winters scare you, you can always hit the treadmill. The city also has many options for organized runs on the weekends. There are races of various lengths every weekend, not to mention the occasional weekday race. The city’s running stores also sponsor fun runs year round. The best thing the city has to offer runners is the Lakefront Trail. It runs for 18 miles along Lake Michigan. It starts at Hollywood Beach about 9 miles north of the Loop and ends at South Shore Beach. In between, you pass harbors, marinas, fountains, statues, skyscrapers, museums, tennis courts, a Ferris wheel, Soldier Field, a country club, golf courses, beaches and over a highway. You will see every type of person you can imagine, and hear languages you don’t understand. 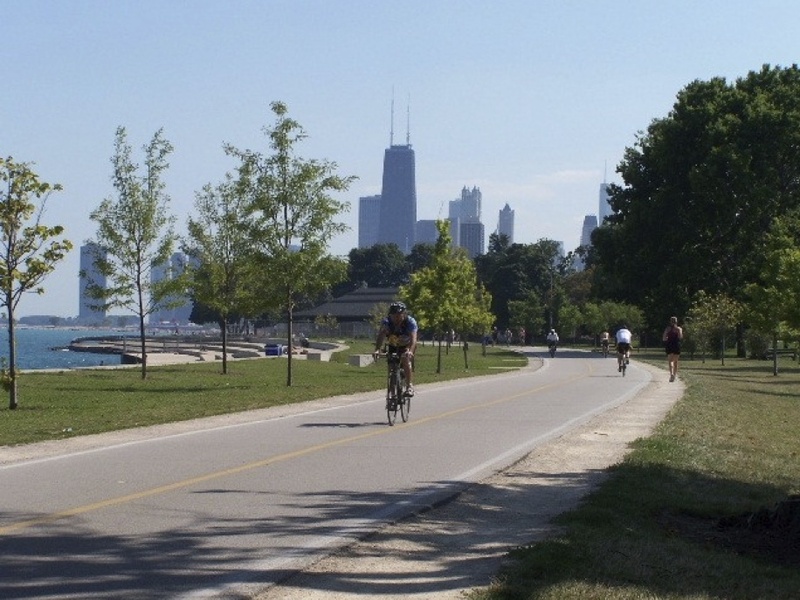 The lake path is a microcosm of what the city of Chicago offers. Nike paid to have the path repaired and added mileage signs every half mile. It is very easy to do a timed run without needing any high-tech equipment. On weekends, there are running groups all along the path. In summer you can see all the charities that are training people for the marathon and half marathon. It’s really inspiring to see non-runners out there every week, increasing their distance and fighting hard for others. My favorite part of the Lakefront Trail is when you’re just running along in a park. There are trees shading your run and grass on both sides. Then the path turns and hits a hill and the view in front of you switches to the Chicago skyline. It makes me grateful to live in this city every time I see it. It’s hard to see the beauty of the skyline when you’re at the base of the buildings. That is why seeing it from a distance always blows me away. Sometimes, if my mood is just right, it will bring me to tears of happiness and gratitude. I have other places in Chicago that I love to run, but none offer everything that the Lakefront Trail does. You can see the past, present and future of the city if you run the entire length.